A high-end body. User control and customization are the main things needed initially. Weatherized body and other things are further off in the future. The V2 looks like it fills most of the high-end needs. V3 gets the user control and customization right. The AW1 is the�ultimate weatherized body. Peaking for manual focus. Actually, any additional help for focusing manually would be useful, as the current system is both clumsy and crude. Better EVF, tiltable LCD. Both these things are now commonly available on competitive systems, so Nikon is falling a bit behind in feature sets, especially with the top-end V2 model. The V3 gave us a good�tillable LCD and a�better EVF. Lenses, lenses, lenses. This is the big problem for serious Nikon 1 users. While the FT1 with F-mount AF-S lenses solves a lot of the telephoto desires, the wide through low-telephoto range is missing a whole bunch of lenses. Specifically, we need a wide zoom (20-35mm equivalent minimum), a rectilinear fisheye, a 24mm small prime equivalent (preferably fast aperture), 35/50/85mm equivalent fast primes, a 24-120mm zoom, and a fast "normal" zoom. That's the bare minimum needed. We've gotten the fast normal lens. The wide angle zoom has been introduced, and it's quite good. Still a number of missing lenses, though.�The 70-300mm was a nice addition, but still missing many lenses. Third party support. Sigma, Tamron, and Tokina are under stress at the moment, as they are finding that there are as many new mounts to support as they've traditionally supported. They all initially have passed on Nikon 1 support, and their m4/3 and NEX support is mostly converted existing designs. Still, Nikon needs them, and is doing nothing to encourage them (not even releasing sales numbers). Both the CX mount and the V1 accessory slot should be documented and that information shared with third parties. Lower prices. There's no reason why the Nikon 1 cameras should be that expensive. 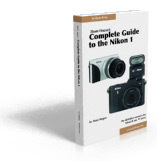 There's room between Coolpix and DLSR pricing to slot the Nikon 1's, but for some reason Nikon isn't doing that.�Progress, mostly via instant rebates. The J1 is now below the low-end DSLR (D3200). And a return to the way it was with the second generation models. Oops. More pixels. With the other mirrorless mounts at 16mp+, Nikon will need to up its game here. That's of course a real tough job with small sensors, but Nikon has been making sensors at the front edge of the state-of-the-art for a number of years now, so not impossible or improbable. Nikon got a lot closer with the 14mp V2.�And better yet with the J4 and V3 at 18mp. Nikon has more to do than some of the other mirrorless makers, and a long way to go to catch up to m4/3. They made a good, overpriced start, but the disturbing thing is the inconsistency between generations of cameras. Nikon appears to still be looking for what works.